Whats not normal is the white band on his wrist. This could actually be the most exciting thing thats happened this year! Is it a bandage? Or a fashion statement? (kinda like Nelly back in the day?) Are white leather bands the new black leather bands? It definately shows of the contouring in his arm... his muscles look good. His elbow is slightly red, does it just look like that cause of the white band or did he knock it? Oh, we could talk about this for weeks! I got to admit. He is starting to bore me out of my skull. LOL @ Sam!! :-) So many interesting questions that need to be pondered! Intriguing, Sam! Also, why is the back of his shirt tucked into his pants and not the front? So many mysteries, so little time. Holy crap, Sam, you're right. lol @ KD!!! And Call me Mo is onto something. Was there a set of photos Becky? we could decifer each and every one! Alas, there was only this one! But that just makes the mystery even greater, because now we have to get all our clues from just this one measly photo... Conspiracy! Can you believe this actually exists?? It's like a Jake Gyllenhaal 8 ball! 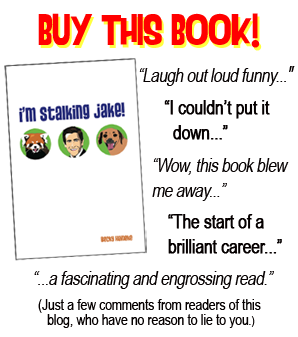 C'mon, let Jake and his boring self be and get a life (or start stalking another celebrity)! Jules, I appreciate the comment. 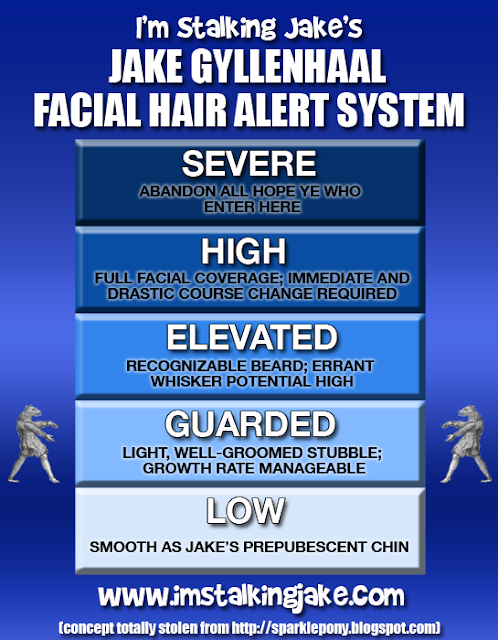 Everyone involved with this site, from me as author to the readers who have commented above, have a very long, complicated, and emotional history of being Jake fans, something we have weathered together over the past five years or so. 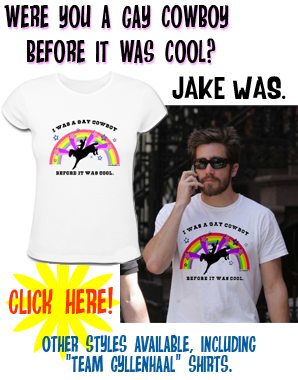 This blog exists to promote the book I wrote about another Jake blog I used to write, back when the shine hadn't worn off of him. I keep up with this as a means of advertising, and admittedly I don't do that very well (I'm luck to get a post in every other week or so). I know about your book and what led to it, and I know about the closed Jake Watch blog. I'm not really interested in knowing about what happened to your group of former Jake fans, I guess it's not my business and you must have had good reasons. The reason why I had to say something today is that I really don't get what this blog is about. If you've lost your interest in Jake's career, if you dislike what he does, if you think he's boring and if the reactions you're talking about mean mocking him well...I can see better ways to spend my time. But hey, this is just me. If you have fun this way then who am I to judge. I was just curious. For the record, I'm not a green fan, I've been following him for years, too and I'm not even a teen who gets silly crushes on celebs. I apologize if I offended you, but since, by your owns words, you "aren't really interested" in "[my] group of fans," then I'm not sure why you bothered to read and comment in the first place. Funny that there's a whole book out there about overly-defensive fans warring with each other over protecting Jake's honor... It was stupid then, it's stupid now. It's Becky's party and she'll make fun of Jake is she wants to. And I didn't say that I'm not interested in your group of Jake fans, I said that I wasn't interested in knowing about "what happened to your group of former Jake fans" and only because it's really not my business. You're entitled to do whatever you want with your website, I wasn't questioning that! Go ahead girls, it's all good! I guess its a silly way of saying we crave more Jake.. by joking and going back and forth with each other in a way we "get some more of him" A simple picture has kept us occupied! And actually, Jules, there are other sites that mock actors and the lows they've fallen to. One that comes to mind right off is a Russell Crowe site, URC (Underground Russell Crowe) which was affectionately founded by a group of RC's disgruntled fans after his asshat antics in Austin on tour with his band.